Our Grand Quadrail Wooden Garden Obelisk provides an elegant and (at around two metres) a tall tower style plant support which is ideal for plants such as roses or clematis. We have taken the name from our smaller four sided plant support. 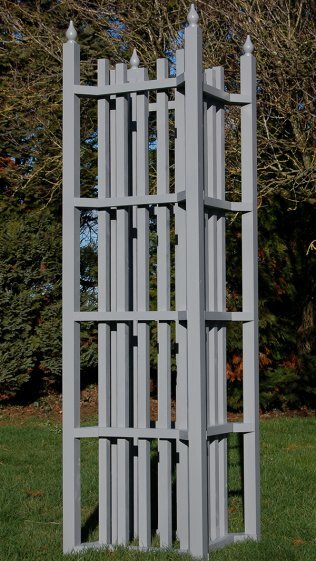 There's nothing small about this garden obelisk though, from its large flying buttress style corner posts to its vertical centre structure, all solid timber. The pictured structures are hand crafted from Scandinavian red pine. We can make them in other timbers on request, British oak, cedar or even accoya if you so wish. They are finished in Cuprinol garden shades or Farrow and Ball exterior paint. It will add dramatic year-round appeal to any garden towering above your ground cover plantings and perennials. While, with its Classic four-sided design and planted with roses, clematis or honeysuckle will transform even the most neglected and dullest of garden corners into cascades of colours and scents. 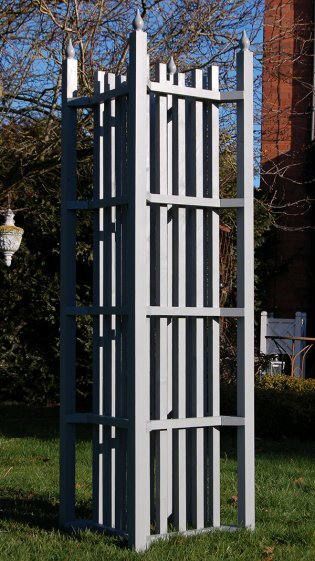 We also supply all our obelisks with eyelets and spikes, at no extra cost, to secure them to the ground. 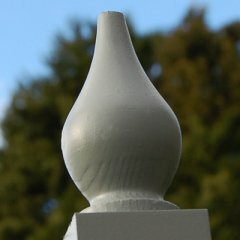 You can only use these if you are positioning the Obelisks on either a soil or grass surface.